Last edited by OldBoy; 11-16-17 at 06:43 PM. Well, color me pleasantly surprised. After Thor’s astoundingly funny and critically acclaimed return to the screen, I was sure that seeing the new Justice League movie so soon afterward would be negatively affected by my recent Marvel experience. I was not a big fan of Man of Steel or BvS: Dawn of Justice. So imagine my astonishment as I ended up laughing and applauding along with an appreciative military audience as Wonder Woman, Batman, The Flash, Aquaman, Cyborg and, eventually, the big Kahuna himself, battled, quipped, wowed, and eventually won the day. DC continues to move in the right direction, following Wonder Woman’s amazing solo debut earlier this year. Director Zack Snyder stepped back from production of Justice League earlier this year after a family tragedy, and Joss Whedon stepped in to wrap things up (he is given a screenplay credit). I do not know if Joss was specifically told to “humor” it up, or if the film was already going in that direction, but it seems that DC has finally taken to heart what Marvel has been showing them for years. Justice League just clicks for the most part, with the weakest aspect of the story being a poorly realized stereotypical supervillain bent on world conquest. As Justice League opens, the world is still mourning the loss of Superman at the hands of Lex Luthor’s creation at the end of Dawn of Justice. There is also a high level of paranoia about alien infiltration and invasion. Bruce Wayne (Ben Affleck) and Diana Prince (Gal Gadot), along with Alfred (Jeremy Irons), realize it’s time to form an alliance of super-powered beings to defend the people of Earth from aliens and other interdimensional beings. At the same time, an ancient enemy, Steppenwolf, appears and attacks Diana’s island home via a powerful “box” (briefly glimpsed in Wonder Woman), one of three that, when merged, will allow Steppenwolf to conquer Earth. 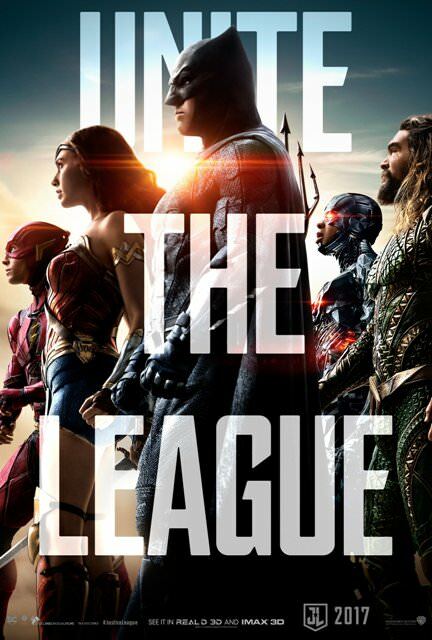 This emerging threat hastens Bruce and Diana to recruit Arthur Curry AKA Aquaman (Jason Momoa), Barry Allen AKA The Flash (Ezra Miller), and Victor Stone AKA Cyborg (Ray Fisher). Allen is eager, but Curry and Stone take a little more convincing, but soon the core team of the Justice League realizes they are going to need some Kryptonian help if they have any chance of stopping Steppenwolf. Justice League plays a lot more like a Marvel movie than previous DC outings. There is more color, the lighting is brighter, and everyone seems to be genuinely having a good time, even Affleck’s repentant Batman. And yes, Justice League is far funnier than anything before it, including Wonder Woman. Miller’s Flash has some of the best lines in the movie, Momoa is a blast as the Atlantean party boy on a mission. Gadot’s Amazonian princess is still a wonder, and even Fisher’s Cyborg contributes to the fun. But I was very happy when Clark/Superman (Henry Cavill) showed up and helped tilt the balance in favor of the good guys. Supporting actors Diane Lane, Amy Adams, Joe Morton and J. K. Simmons were great in their respective roles. The only complaint I have about Justice League is the villain Steppenwolf (voiced by Ciaran Hinds). The character itself is a step down from Ares in Wonder Woman, and is very poorly realized through CG animation. It did not seem that enough thought or effort went into his motives or execution. But that is my ONLY complaint. The rest of the movie jelled just right for me. I was entertained, I enjoyed seeing Flash’s amazement at being part of a superhero team, I enjoyed the funny references to Aquaman’s fish whispering, and so forth. I will definitely be seeing Justice League again after it opens, and am giving it 4 out of 5 lightsabers. Keep up the good work, DC. Let’s see what you do with the upcoming Aquaman and Flash movies! NOTES FOR PARENTS - Justice League is rated PG-13 for straight-forward comic book action and fantasy violence. I only heard two s***, one a**, and one S-O-B. A woman’s television interview is heavily bleeped. No F-bombs are heard. Steppenwolf’s bug-like drone soldiers have glowing red eyes and are generally creepy looking. They kill some civilians, and lots of the drones are taken out by our heros in the big climactic battle. The scene where the team encounters Kal-El after he returns is both suspenseful and humorous. There is nothing of an inappropriate sexual nature at all. MID AND AFTER CREDITS: Mid-credits, there’s a funny throwdown between two of our heros. After-credits sets up a possible sequel and potential foes. Last edited by Orbi-Wan Techno; 11-12-17 at 08:24 AM. Although I didn't mention it in the article, I was extremely pleased with Danny Elfman's music score throughout this movie. Parts of it integrated the Batman theme from the 90s, and Williams' score from the Reeve Superman movies. I'm SO glad they are finally embracing the music history. William's theme is as much a part of Superman as the red cape and blue spandex. Batman, slightly less so but still an amazing theme that is worthy of reviving and carrying forward. Amen, and trust me, just hearing those cues during the movie gained Justice League a LOT of goodwill. Good review. Not that I needed any convincing. Already bought my ticket for next Sunday. Now I’m even more looking forward to it. How long is Supes in this? Are there any cameos from Green Lantern or any other new characters? The Green Lantern Corps is briefly referenced/shown in a flashback about Steppenwolf. Eh, er, uh, sit through the end credits. Also, one of the final scenes involves the purchase of a large hall and talk of allowing room for more members. Nah, I’ll answer other questions in spoiler tags. Last edited by Orbi-Wan Techno; 11-12-17 at 03:38 PM. Trying to keep my expectations in check but this is sounding decent. Looking forward to checking it out. Since I'll be using Movie Pass, I won't complain too much. Guessing it'll be okay. Calling it now Mike86 will really enjoy it, but will ultimately say "it was good but overrated"
"Justice League was an improvement over BvS but was just OK. It wasn't as good as Wonder Woman though, which was overrated." Naw, it's hard to be overrated if everybody says it's just OK. OK covers a huge range. The acclaim on Wonder Woman was definitely high, so yeah, I get it? I guess? LOL. Way better than Man of Steel and BvS, not as good as Wonder Woman (which I loved), and better than most of the minor Marvel movies, IMHO. It’s because I liked but didn’t love Wonder Woman and have expressed that I felt it was overrated. It’s a running joke from the main thread for the film because I said it more than I realized and was called on it. Of course with my standing as the resident DC hater I have to have it pointed out again and again too which is also repeated by a lot of people even though it’s not really true other than regarding the current films but whatever. Last edited by Mike86; 11-13-17 at 10:54 AM. Doesn't one of the commercials have a line where Steppenwolf says there are no GLs to protect Earth? Because they took Deadpool's ring away when his movie bombed, I assume. Green Lantern Corps is shown during a flashback about a battle thousand of years ago. The Ryan Reynolds GL was originally supposed to be the first DCEU movie. Then it bombed horribly, so it wasn't. They had better bring a proper GL into this series. One positive thing I can definitely say about it is we won't have to see Steven Mnuchin's name in the credits this time. It amused me to see his name on the remake of Going In Style, kind of ironic considering the subject manner.